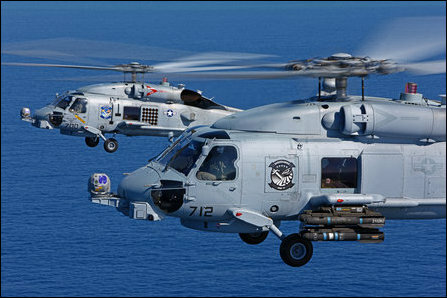 India is set to purchase twenty-four Sikorsky MH-60R Seahawk choppers (also known as Romeo choppers) from the USA for USD 2.4 billion, the Pentagon said on Wednesday. The US Navy operates more than 250 Romeo choppers, which were developed based on the US Army’s UH-60 Black Hawk, as its primary helicopters for anti-submarine warfare and open ocean duties. The Indian move comes after the Australian Navy upgrading its naval combat capabilities with Seahawk ‘Romeo’ helicopters between 2014 and 2016. Japan, the fourth member of the Quadrilateral Security Dialogue (Quad) formation, has already modernised its military helicopter fleet with its own Mitsubishi H-60 series equivalent of the anti-submarine helicopters. The announcement also coincides with NATO marking 70 years on Thursday this week. The USA, which is actively promoting the Quad formation in the Indo Pacific to address the military challenge from the emerging power China, is demanding the European countries “to do more” in NATO in terms of their financial contribution if they are concerned with the Russian threat in Europe. As the USA is continuing to appease the countries in the Indo-Pacific, US President Donal Trump has also been pitching for arms exports to Vietnam, reports said. “Vietnam has emerged as the most vocal opponent of China’s territorial claims and has been buying U.S. military hardware, such as an armed Hamilton-class Coast Guard cutter,” a report filed by the Reuters said. The USA has delivered six patrol boats to Vietnam’s Coast Guard on Monday. Apart from the QUAD countries, Denmark and Saudi Arabia have also obtained Romeo choppers in recent times. According to Flight Global, MH-60R Seahawks are used by the US Navy for “anti-submarine warfare, anti-surface warfare, surveillance, communications relay, combat search and rescue, naval gunfire support and logistics support missions”. The Lockheed Martin-built Romeo choppers are armed with torpedoes, Hellfire missiles, Advanced Precision Kill Weapon System rockets, and .50 calibre machine guns. The sale is still subject to congressional approval in the USA. “The proposed sale will provide India the capability to perform anti-surface and anti-submarine warfare missions along with the ability to perform secondary missions including vertical replenishment, search and rescue, and communications relay,” said a statement issued by the US Defense Security Cooperation Agency (DSCA) on Tuesday. India would be using the enhanced capability as a “deterrent to regional threats and to strengthen its homeland defense,” the Pentagon agency further stated. “This proposed sale will support the foreign policy and national security of the United States by helping to strengthen the U.S.-Indian strategic relationship and to improve the security of a major defensive partner which continues to be an important force for political stability, peace, and economic progress in the Indo-Pacific and South Asia region,” the DSCA statement further observed. In the meantime, a news report filed by the New Delhi Television Limited (NDTV) noted on Wednesday that India's Navy had been operating without a dedicated anti-submarine helicopter relying upon Chetak (Alouette III) choppers [natively developed with a French license] for a long time. India was still flying British made Sea King helicopters from 1971, the NDTV report observed.